Married and single mothers suffer higher rates of depression when they live in multi-generational households in their baby's first year of life, the study found. But for moms who live with their romantic partners but aren't married, having one or more grandparents in the house is linked to lower rates of depression. The pattern held true for rich, poor and middle class women. The findings varied by race, however, with Latina single mothers faring especially poorly in multi-generational households. Latina single moms were six times more likely to experience depression if they lived in multi-generational households in their child's first year of life than if they did not. The variance between subgroups may partly reflect differing expectations and stigmas, said lead author Joy Piontak, a research analyst with the Duke University Center for Child and Family Policy. For instance, married couples commonly expect to maintain a separate household. Cohabiting couples don't always face the same expectations, as other researchers have noted. Still, Piontak cautioned that she can't say for certain what causal relationship is at play. Living with grandparents may worsen depression for single and married mothers. Or, depressed single and married moms may be less likely to move out from a multi-generational household. Also, no information was available regarding relationship quality within the households. Such data could shed further light on how household composition may affect mental health, Piontak said. The study, which drew upon a nationally representative sample of nearly 3,000 married, single and cohabiting mothers, is unusual in its focus on multi-generational families. While single mothers have captured a great deal of scholarly and popular attention, three-generation households remain little-examined. Yet such households are quite common. Some 7.8 million children, or 11 percent of all U.S. children, live in multi-generational households. Such living arrangements are even more common among certain subgroups. 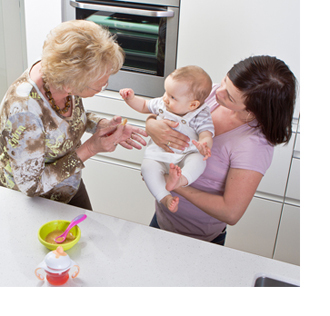 For instance, nearly half of all children born to single mothers spend some time living with their grandparents. Piontak said she hopes more scholars will consider this increasingly common form of American family living. "We often talk about families in terms of mothers, fathers and children," Piontak said. "Or we talk about the marital status of the mothers. Families are often a lot more complex than we imagine them to be, though. And that complexity can affect mothers' well-being." Grandma Psych: Who's the Decider? Parents or Grandparents? Press materials provided by Duke University.